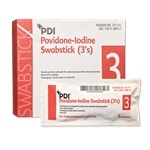 10% impregnated Povidone Iodine swab sticks with 4" plastic shaft and sponge tips. Manufactured by Dynarex. 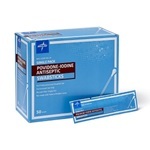 Comes 1 swab stick per pack and 50 sticks total. 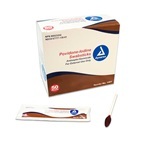 10% impregnated Povidone Iodine swab sticks with 4" plastic shaft and rayon tips. Manufactured by Medline. Comes 1 swab sticks per pack, 50 per box. 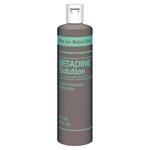 Betadine prep solution contains 10% povidone iodine in an 8 oz. flip-top bottle. Manufactured by Emerson Healthcare. Comes as singles. 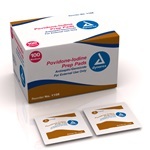 Medium, non-sterile, non-woven povidone iodine prep pads saturated with 10% povidone iodine. Comes in a box of 100. Manufactured by Dynarex. Measures 2.5" x 1.25". 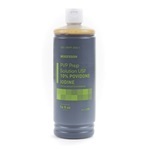 PVP prep solution contains 10% povidone iodine in a 16 oz. flip-top bottle. Manufactured by McKesson. Comes as singles.